This article is about the incumbent Governor of Maine. For the Connecticut State Representative, see Janet M. Mills. Janet Trafton Mills (born December 30, 1947) is an American lawyer and politician serving as the 75th Governor of Maine, since January 2019. She previously served as the Attorney General of Maine on two separate occasions. A member of the Democratic Party, Mills was first elected Maine Attorney General by the Maine Legislature on January 6, 2009, succeeding G. Steven Rowe. Her second term began on January 3, 2013, after the term of Republican William Schneider. She is the first woman to hold the position of Attorney General of Maine. Prior to her election, she served in the Maine House of Representatives representing the towns of Farmington and Industry. She was nominated by her party for Governor of Maine in the 2018 gubernatorial election. She won the November general election, defeating Republican Shawn Moody and Independent Terry Hayes. On January 2, 2019, she became the first female Governor of Maine. Mills was born in Farmington, Maine, the daughter of Katherine Louise (Coffin) and Sumner Peter Mills Jr. Her mother was a schoolteacher, and her father was a lawyer who served as U.S. Attorney for Maine in the 1950s. Mills graduated from Farmington High School in 1965. As a teenager, she spent nearly a year bedridden in a full-body cast due to severe scoleosis, which was corrected surgically. She briefly attended Colby College before moving to San Francisco, where she worked as a nursing assistant in a psychiatric hospital. She later enrolled at the University of Massachusetts Boston, from which she graduated with a bachelor of arts degree in 1970. During her time at UMass, Mills traveled through Western Europe and became fluent in French. In 1973 she began attendance at the University of Maine School of Law and in 1974 she was a summer intern in Washington, D.C. for civil rights attorney Charles Morgan Jr. of the American Civil Liberties Union. Mills graduated with a JD in 1976 and was admitted to the bar. Mills was Maine's first female criminal prosecutor and was an assistant attorney general from 1976 to 1980, prosecuting homicides and other major crimes. In 1980, she was elected district attorney for Androscoggin, Franklin and Oxford counties, a position to which she was re-elected three times. She was the first woman district attorney in Maine, as well as the first woman district attorney in New England. In 1994, Mills was an unsuccessful candidate for the United States Congress in the Democratic primary to replace then Republican congresswoman Olympia Snowe. She placed 3rd, losing to John Baldacci. Mills was a co-founder of the Maine Women's Lobby and was elected to the board of directors of in 1998. In 2002, Mills was elected to the Maine House of Representatives as a Democrat. During this time, she served on the judiciary, criminal justice, and appropriations committees. Mills was elected to her fourth term when the Joint Convention convened in December 2008 to elect the new Attorney General. Out of several candidates, she was elected and became the 55th Attorney General of Maine on January 6, 2009. When Republicans gained control of the Maine Legislature in 2010, Mills, a Democrat, was not reelected to another term. In January 2011, she was elected vice chair of the Maine Democratic Party. She joined the law firm Preti Flaherty in February 2011 as a lawyer with the firm's Litigation Group in its Augusta, Maine office. When Democrats regained control of the legislature in the 2012 elections, she was again chosen to be attorney general, resigned as vice chair of the Maine Democratic Party, and took the oath of office as attorney general on January 7, 2013. She was re-elected to her position on December 3, 2014, despite the Maine Senate coming under Republican control. Republican Governor Paul LePage opposed Mills being attorney general, due to many disputes between them over the legality of some of LePage's policies. On January 28, 2015, LePage requested the Maine Supreme Judicial Court give its opinion as to whether it was legal for the Governor's office to need the permission of the Attorney General's office to retain outside counsel when the AG declines to represent the State in a legal matter. LePage did so after two instances of Mills declining to represent LePage in matters which she determined had little legal merit, though she approved his requests to have outside lawyers. On May 1, 2017, LePage filed a lawsuit against Mills, asserting that Mills has abused her authority when refusing to represent the state in legal matters, or taking a legal view contrary to that of the LePage administration. On July 10, 2017, Mills announced that she would be seeking the Democratic Party nomination for Governor of Maine in 2018. She was one of several candidates in the Democratic primary for governor in 2018. She won the nomination in June, finishing first after four rounds of ranked choice voting gave her 54% to her closest competitor's 46%. In the general election, Mills faced Republican businessman Shawn Moody, independent Maine State Treasurer Terry Hayes and independent businessman Alan Caron. Endorsed by every major newspaper in Maine and the Boston Globe, buoyed by major ad buys from Democratic political action committees and receiving the endorsement of Caron a week before the polls closed, Mills won the election with 50.9% and 43.2% for Moody. She became the first female Governor of Maine, the first Maine gubernatorial candidate to be elected with at least 50% of the vote since Angus King in 1998 and the first to win at least 50% of the vote for a first term since Kenneth M. Curtis in 1966. Mills is the first woman ever elected to the governor's position in the state of Maine. She received over 320,000 votes, more than any governor in the state's history. Mills' campaign was aided in part by a Democratic super PAC which financed Maine-themed clickbait ads meant to attract young voters on social media. Both Mills and outside groups outspent her closest contender, Republican candidate Shawn Moody, by an average of $15 per vote cast for a grand total of $10.7 million. These numbers, however, are less than those of the 2nd District Congressional race of the same year, where Democrat Jared Golden spent $131 per vote cast, and incumbent Republican Bruce Poliquin spent on average $95 per vote. One of Mills' first acts as governor was to sign an executive order to carry out the expansion of Maine's Medicaid program as called for by a 2017 referendum, something LePage had refused to do. This fulfilled a major campaign pledge. Mills also dropped work requirements for Medicaid that her predecessor LePage had requested towards the end of his tenure and which had the approval of the Trump administration. She said the work requirements "leave more Maine people uninsured without improving their participation in the workforce". Mills revived the tradition of Maine governors attending Martin Luther King Day commemoration events in Portland, doing so in 2019. In 1985 Mills married real estate developer Stanley Kuklinski, with whom she had five stepdaughters and three grandsons. Kuklinski died due to the effects of a stroke on September 24, 2014. She is the sister of Peter Mills, a former Republican state senator and gubernatorial candidate in 2006 and 2010. ^ "Janet Mills wins race to succeed LePage as Maine's next governor". Bangor Daily News. Retrieved November 7, 2018. ^ a b "Janet Mills' mission: Break yet another glass ceiling - Journal Tribune". September 23, 2018. ^ a b c d e f Nicoll, Don (December 20, 1999). "Mills, Janet oral history interview". Bates.edu. Lewiston, ME: Bates College. p. 2. ^ "Janet Mills' family looking forward to inauguration". WCSH. Retrieved March 5, 2019. ^ Solloway, Steve (October 30, 2018). 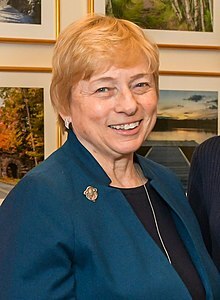 "The rebel with a cause: Supporters believe Janet Mills' experience, family legacy and legal mind have prepared her well to be Maine's first female governor". Pine Tree Watch. Hallowell, ME. ^ "Office of the Maine AG: Biography of Attorney General Janet T. Mills". www.maine.gov. Retrieved February 6, 2017. ^ Woodard, Colin (September 16, 2018). "Janet Mills' mission: Break yet another glass ceiling". Portland Press Herald. Retrieved November 19, 2018. ^ "Mills elected to Maine Women's Lobby board". Sun Journal. December 22, 1998. ^ Harrison, Judy (January 6, 2009). "Janet Mills takes oath as Maine's first female AG". Bangor Daily News. Retrieved September 6, 2018. ^ "Portland lawyer chosen as Maine Dems chairman". Bangor Daily News. January 24, 2011. ^ "Ben Grant Re-Elected as Chair of the Maine Democratic Party". Maine Democratic Party. ^ "Maine constitutional officials to take oaths". Central Maine. January 7, 2013. ^ Mistler, Steve (December 4, 2014). "Hayes wins election as state treasurer". Kennebec Journal. Retrieved September 6, 2018. ^ Cousins, Christopher (December 5, 2014). "Split Legislature creates uncertain re-election path for Democrats in Maine constitutional offices". Bangor Daily News. Retrieved November 26, 2014. ^ Moretto, Mario (January 28, 2015). "Maine high court to weigh questions about AG Mills' refusal to represent LePage". Bangor Daily News. Retrieved January 29, 2015. ^ Cousins, Christopher (May 1, 2017). "LePage sues attorney general for not representing his legal positions". Bangor Daily News. Retrieved May 1, 2017. ^ Thistle, Scott (July 10, 2017). "Maine Attorney General Janet Mills enters 2018 race for governor - Portland Press Herald". Press Herald. Retrieved July 15, 2017. ^ Shepherd, Michael (June 20, 2018). "Mills wins Maine Democratic gubernatorial nomination after ranked-choice count". Bangor Daily News. Bangor, ME. ^ "Gov.-elect Janet Mills announces transition team - Portland Press Herald". Press Herald. November 10, 2017. Retrieved November 19, 2018. ^ Gallagher, Noel K. (September 7, 2018). "Democratic super PAC spends almost $500,000 to back Janet Mills for Governor - Portland Press Herald". Press Herald. Retrieved November 19, 2018. ^ Gallagher, Noel K. (November 18, 2018). "Most per vote, $131, spent on Golden in 2nd District - Portland Press Herald". Press Herald. Retrieved November 19, 2018. ^ Lawlor, Joe (January 3, 2019). "Mills' 'Executive Order 1' makes 70,000 more Mainers eligible for health insurance". Kennebec Journal. Retrieved January 6, 2019. ^ Writer, Joe LawlorStaff (January 22, 2019). "Maine Gov. Mills rejects work requirements LePage sought for Medicaid". Press Herald. Retrieved January 29, 2019. ^ York, Samantha (January 21, 2019). "Mills is first governor to attend Portland MLK event in 8 years". newscentermaine.com. Retrieved January 22, 2019. ^ Koenig, Paul (September 29, 2014). "Husband of Maine attorney general dies from effects of stroke". Portland Press Herald. Retrieved December 4, 2014. Wikimedia Commons has media related to Janet T. Mills. This page was last edited on 18 April 2019, at 18:10 (UTC).